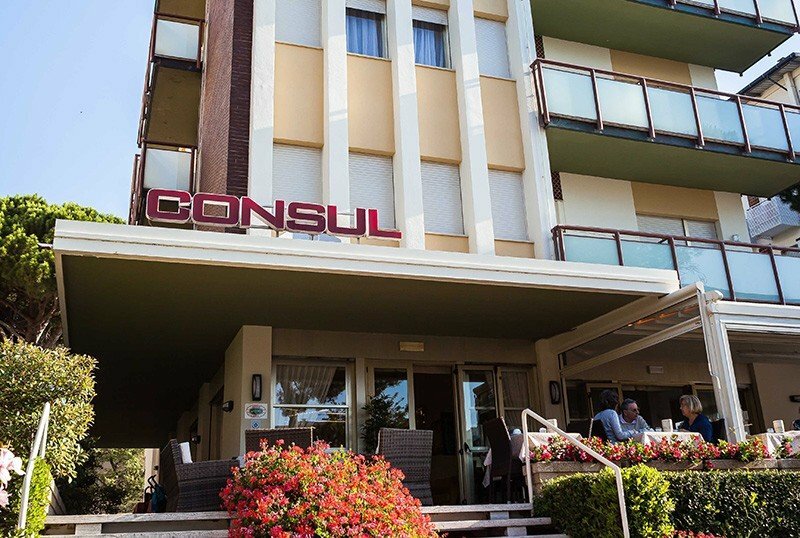 Family run and located a few steps from the beach of Milano Marittima, the Consul Hotel is a three-star hotel with many services available including: garden, children's playground area, parking and WI-FI connection. Accept small pets. The hotel is located a few steps from the beach, in a quiet area and close to the center of Milano Marittima and its shopping streets. The pine grove is less than 10 minutes walk from the hotel which is well connected by public transport to the nearby town of Cervia and the Mirabilandia amusement park. The rooms are all equipped with a balcony, some with sea views, independent air conditioning and heating, satellite and digital terrestrial LCD TV, telephone, safe and private bathroom with shower and hairdryer. Minibar upon request and payment. FAMILIES: communicating solutions are available, ideal for groups and families. Garden equipped with solarium and sunbeds, sofas, tables, a large open-air porch and a playground area for children, free use of bicycles also with child seat, lift, bar area, restaurant, TV room, newspapers in consultation. The structure is equipped for cyclists and organizes theme nights. PARKING: uncovered, not guarded, available until exhaustion. AGREEMENTS: beach, amusement parks, discos, tennis courts. SERVICES FOR DISABLED PEOPLE: entrance with inclined ramp. BREAKFAST: served on the terrace and consisting of sweet and savory buffet, with cheeses, cold cuts, brioches, yogurt, homemade cakes, fruit juices. LUNCH AND DINNER: menu with 4 choices, with recipes of traditional local cuisine based on meat and fish, always accompanied by appetizers and vegetables available at buffet and homemade desserts. CHANGES: available variations also for celiacs and vegetarians. OTHER: each week we organize theme dinners. In the hotel: outdoor playground area and bicycles with seats. Baby sitter on request and for a fee. In the room: cots and beds with sides. At the restaurant: high chairs at the table and dedicated menus (baby menus and baby food) served at flexible times. On the beach: entertainment and baby park. The hotel has an agreement with Bagno Giorgio, equipped with sports fields, baby park and entertainment for children, relaxation areas and catering services. The prices of the list are per person per day for a min. of 3 nights. TOURIST TAX: excluded. € 1.00 (April-May-September), € 1.50 (June-July-August) per day per person for a maximum of 7 nights, excluding children up to 14 years. FULL BOARD: Full board + Beach Service (1 beach umbrella and 2 sunbeds per room in a partner establishment opposite the Hotel). Possibility of formula with full board without the beach included. Here is a super offer where children up to 10 years *, in a room with two adults, will stay for free. And of course there is also the beach included in the price! Special offers HOTEL + TICKET! .. All included in the price! Wonderland is just 7km from 'Hotel! Come and spend Easter with us in Milano Marittima! 2 nights: € 115.00 per person 3 nights: € 165.00 per person Super discounts for all children! Come and spend Easter with us in Milano Marittima! Super discounts for all children! And more: super offers for Mirabilandia with children FREE! Take advantage of spring bridges to enjoy the sea and the first sun of the season! You can choose the treatment you prefer from BB, half board or full board, even with BEACH INCLUDED!